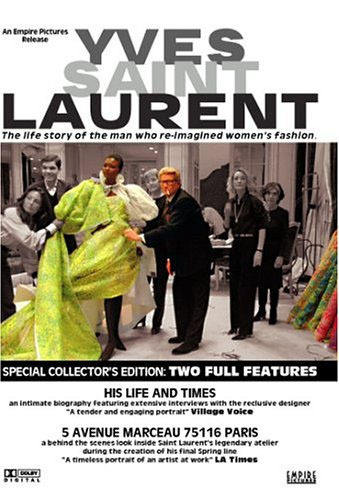 I have been rounding out my knowledge of fashion history from the decade after WWII up through the late 1990s with the documentary Yves Saint Laurent: His Life and Times. Filmmaker David Teboul got Saint Laurent to give lengthy interviews in 2001 that trace his roots as a young boy growing up in Algeria to the teenager who won prizes in design competitions, from the young man who took over the storied house of Dior (at 21! 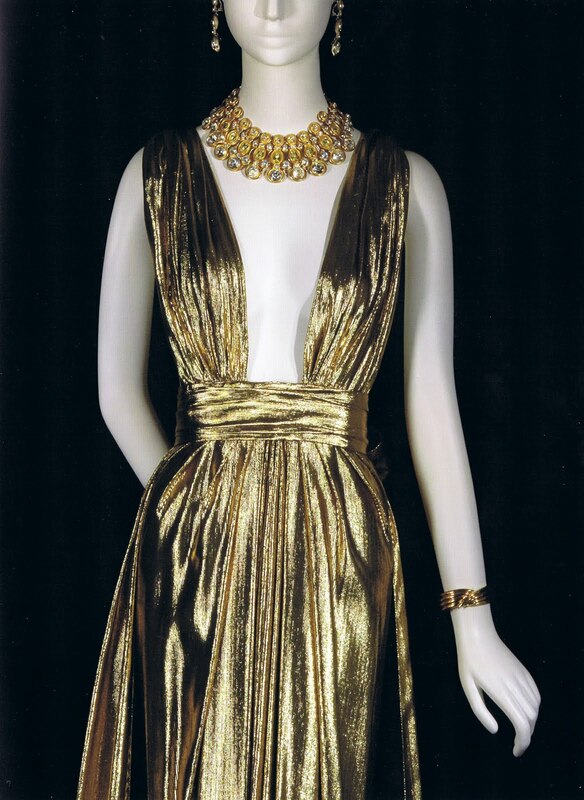 ), to the couturier who started his own house in 1962. Interspersed are interviews with Saint Laurent’s mother, Lucienne Mathieu-Saint-Laurent, his companion and business partner Pierre Bergé, and friends and muses Betty Catroux and Loulou de la Falaise, which give a more complete view of Yves and his world. Some of my favorite moments were the fashion shows—I love seeing mid-century fashion shows, always held in cramped gilded salons where there is no music, no elbow room, and the ladies smoke, take notes, and even make comments about the clothes in the full hearing of everyone around them. Hilarious! Fall-Winter 1990 Haute Couture Collection. 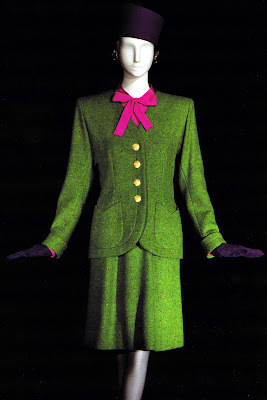 Green tweed; pink crepe blouse. Also interesting are the interviews Saint Laurent gave at various points in his career. It’s clear he felt a deep affinity for Coco Chanel, calling her in one 1968 interview his favorite person in history and saying she and Balenciaga in his (young) opinion were the two greats, making a mark on their day and their art. At the time he didn’t consider himself, or any of his contemporaries, at that level. By 2001 he still considered Chanel “the only house that still has its own style, along with mine.” He’s right—all the tie-neck blouses we will see this fall, the color combinations, and the influence of the 1970s seem a direct reference to the Yves Saint Laurent style. 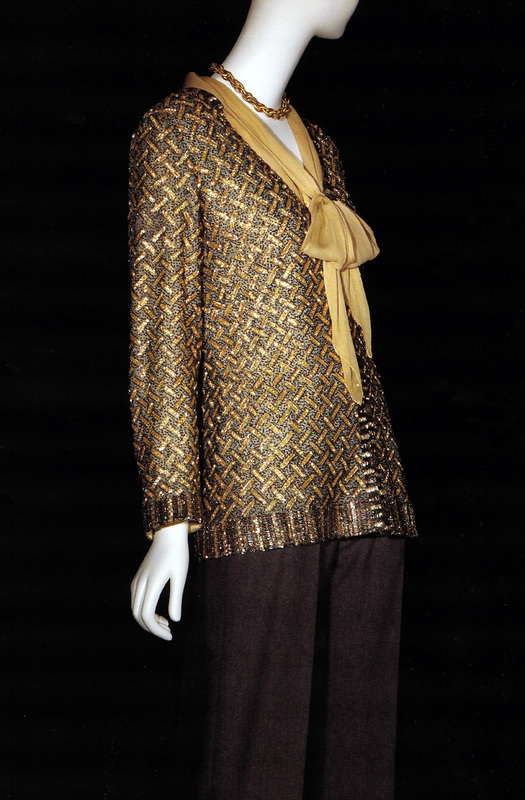 Fall-Winter 1973 Haute Couture Collection. Cardigan embroidered with gold, gray, and silver; sand-colored chiffon blouse, gray flannel pants. Made to order by Lauren Bacall. I'm convinced all the tie-neck blouses we are going to see this fall are because of the YSL retrospective held last year in Paris. Spring-Summer 1981 Haute Couture Collection. 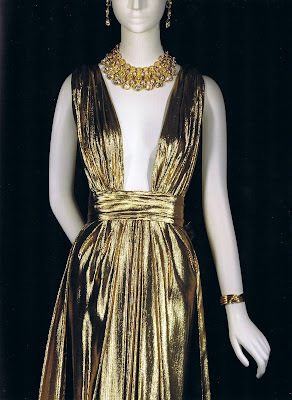 Gold-and-silver lamé gauze. Yves Saint Laurent: His Life and Times is essential viewing for anyone wanting to understand the changes in fashion since the 1950s and Yves’ part in bringing them about. If you want to watch Yves and his atelier at work creating his final collection before his retirement, the same disc contains 5 Avenue Marceau 75116 Paris, which I reviewed here. All photos of the clothes are by Alexandre Guirkinger, from the excellent book Yves Saint Laurent by Florence Müller and Farid Chenoune. I have seen it, and I was so deeply touched by his genius, and trouble soul. Be very safe this weekend. I'm worried about all of my east coast friends. In my Netflix Queue NOW. Oh how I want this to come tomorrow, because now I just can't wait! :) I hope you have a safe weekend, my dear. I'll be thinking of you today. Wow I really want to watch this film! I love the description of older shows with the ladies talking - that sounds hilarious but very genuine :) Thank you for the recommendation! What stunning creations his clothes are - doesn't that green suit with the shocking pink blouse pack a punch! Hi Sacramento, it would've been interesting to learn more about YSL's depression and breakdowns that are only hinted at in the film. I will be looking for a good biography of him soon. Hi Terri, if you find a good YSL biography, please let me know! I love your book recommendations. As for YSL and the black models he employed, I got the sense in the second film about his atelier that he really loved them and God knows they were gorgeous and wore clothes so beautifully. As for Hurricane Irene, we didn't get the worst of it, so I feel very lucky. Hi Catherine, please let me know what you think once you see this documentary! I'm still thinking about the Hermes sale in NYC next month. I don't know if I'm up to it and it's during the week but I will report back here if I make the trip. Hi Katherine, thanks for stopping by! I love seeing old fashion shows. They showed some at the Balenciaga exhibit in NYC too and they were a complete crack-up--the smoke hanging in the air, the catty ladies, the models carrying numbers. They look completely different from a modern fashion show. I would love to see a documentary that traces the history of fashion shows, especially at what point they grew to be the thing they are today--big extravaganzas! BTW, stopped by your blog, love what you are doing and DEEPLY love your gorgeous Birkin. Hermes fans welcome here, I am a new convert and find five news things to covet every time I go to the Wall Street store. Hi Veshoevius, when I was looking through the YSL book for images, I was struck by the color combinations of his clothes and since Fall 2011 clothes have so much color in them, in those wild combinations that Yves used (and I am specifically thinking of the Gucci collection for this fall), I'm convinced the designers all went to the YSL retrospective last year in Paris and were inspired. The book these images came from was the catalog for that show.